Planet X has been appearing on SOHO and the Stereo Ahead for some months now, in approximately the 4:30 o'clock position. But sometimes something bright with a tail shows up in other places, above the Sun, or to the left of the Sun. If this is Planet X, why is it moving around so much? ZetaTalk Explanation 1/2/2010: When the Winged Globe or the Red Cross appears to the lower right on the Sun, this is the Planet X corpus. We have explained that the tail is vast, the Moon swirls swinging to either side of Planet X by 5 million miles, but the tail itself swings further than that. During the hour of the pole shift, when Planet X is a mere 14 million miles from the Earth, the tail is whipping the Earth, depositing hail and red dust. The tail itself can catch the light, reflecting this to Earth, in what appears to be a blaze of light with a tail drifting away. It is charged, so clings to itself in places, so is thicker in some places than others, just as an electrical charge can raise the hair on your head. As Planet X turns its charged tail toward the Earth, increasingly, such sudden appearances will increase, consternating NASA. 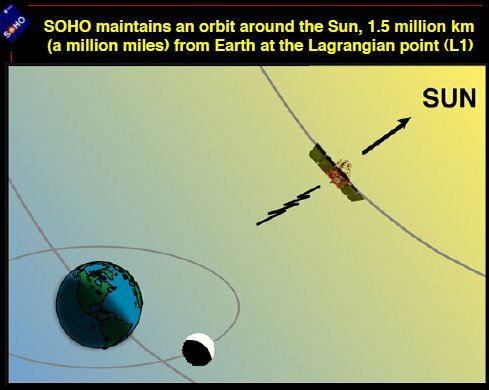 SOHO is approximately 1.5 million miles from Earth, stationary, sunside of the Earth which is 93 million miles from the Sun. Just how far does that tail spread? During the 2002-2003 CCD imaging of Planet X in the night sky, as it was inbound, light clouds around the body of Planet X were often noted. And debris in the tail of Planet X is certainly inbound lately, in the form of fireballs. Fireballs on on the increase, showing a sharp increase since 2005. Indeed, in this past month alone, the fireballs hitting the press were most certainly not part of the Gemini meteor show. Fireballs are occurring year-round, screaming across several states or provinces, lately in California on December 17, Hawaii on December 11, and Minnesota on December 12. Monstrously bright, this fireball meteor lit up the Mojave Desert sky. Yoder said he found it hard to believe there has not yet been an explanation for what he saw, much like the loud noise over Kalaheo reported by residents in May of this year. "I've seen meteorites all my life," he said. But added that what he saw was much different. "It was either a gigantic asteroid or one of the biggest meteorites I have ever seen." A brilliant bright blue-green flash lit up a huge portion of the sky from western Minnesota to eastern Wisconsin Friday night -- the event was enough to make the night sky momentarily seem like daylight. It was almost certainly a fireball meteorite, say meteorologists and local amateur astronomers. In fact, the earth is currently orbiting into that portion of space strewn with those extraterrestrial rocks that produce the Geminid meteor showers every year at this time. Russia surprised the world by announcing they were planning to send a rocket aloft before 2029, to deflect a Near Earth Orbit asteroid expected to pass close to the Earth. Russia is considering sending a spacecraft to a large asteroid to knock it off its path and prevent a possible collision with Earth. Anatoly Perminov said the space agency will hold a meeting soon to assess a mission to Apophis. It would invite NASA, the European Space Agency, the Chinese space agency and others to join the project once it is finalized. "Apophis is just a symbolic example, there are many other dangerous objects we know little about," he said. Per the Zetas, there is another agenda afoot. ZetaTalk Explanation 1/2/2010: This is an attempt to reassure the populace that the establishment intends to do something about incoming debris. The timing of the release, the article, is an attempt to get ahead of what the establishment assumes will be increasing fireballs, visible swarms of debris in the sky. The populace is to say to themselves that help is on the way, the establishment will address the issue, when in fact nothing can be done. Unless debris is in an Earth orbit, like the space junk man leaves behind during ISS maintenance or satellite disposal, it cannot be targeted. Nevertheless, this subject was all the rage back in the 1990's, when deflecting NEO asteroids was under serious discussion, such organizations as Spaceguard UK were looking for solutions. The Zetas were debating astronomers and others on the sci.astro Usenet in 2001. Despite the Zetas telling them that deflecting an asteroid was not possible, they were interested in the Zetas perspective. I'd be delighted to have ZetaTalk included! You absolutely have permission to include the existing ZetaTalk you've included below, as well as the NEW ZetaTalk given in response to your comments :-). Since these topics are also being addressed on sci.astro, during the current debates the Zetas are engaged in there, I am assuming it would also be OK to post this to the sci.astro Usenet. > acquiescence to publish the item as it stands. > The aim is to deflect an object, not to "vaporise"
> convert a cannon ball into a cluster bomb. > reaction slightly modifying the NEO's trajectory. Jonathan Tate was reacting to the ZetaTalk, below. ZetaTalk Explanation 7/15/1996: Recently the media and Internet message boards have been alerting the populace to the presence of what is termed near-miss asteroids. Discussion ensues on how to deflect them should they threaten to impact the Earth, as though deflection would be possible. Does mankind now have the means to deflect such large, rapidly moving objects? Such a deflection would require a precisely placed explosive device of sufficient strength to vaporize the asteroid. Disintegration would be required because deflection is not possible in space. This statement will meet with vehement objection, especially from the arm of the establishment which seeks only to deflect panic in the populace. It is not a collision with an asteroid which will shortly devastate Earth, it is the passage of the monster Planet X, ever drawing closer. Nor will deflection of the trash in this giant comet's tail be possible - boulders as large as trucks thumping to Earth on occasion and the peppering of red dust and gravel. Deflection of these few boulders is not possible either, as they are shrouded in the swirling dust of the tail, and only visible just before impact. All the sudden upsurge in talk about the dangers asteroids present, and all the talk in the late 1990's about reviving the Star Wars program to address this threat is not because something can actually be done. Short of making practical plans to survive the coming pole shift while hunkered down on the surface of the Earth, mankind has no options, and those in the establishment who talk up asteroid deflection possibilities know this. They are simply buying themselves time by pushing the point where panic in the populace gets heated as far out as possible. Hopefully, the panic button won't be hit until those members of the establishment are safely away in their well stocked enclaves, and then the rest of humanity, who has been reassured that their government can protect them, be damned. 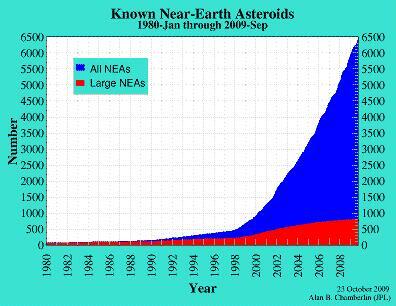 Near Earth Orbit asteroids are on the increase. 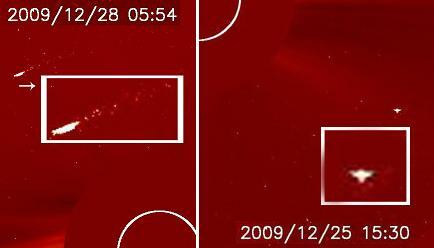 Per the Zetas, this is due to the gravity attraction and magnetic disruption caused by the presence of Planet X. However, the Zetas say no asteroid will be allowed to impact the Earth, as the Council of Worlds has decreed that this should be prevented. They have plans for Earth, and their plans do not include its destruction. San Diego is in the center of a bow formed by bending the tip of the Aleutian Island toward the tip of Mexico. The N American Plate has a flat top and cannot roll to adjust when the Atlantic widens at the middle, at the Equator. Thus, the bow. ZetaTalk Explanation 2/10/2006: The giant plates of N America and Eurasia are locked against each other, unable to rotate against each other due to their shape. This creates a diagonal stress on the N American continent where New England is pulled to the east while Mexico is pulled to the West. 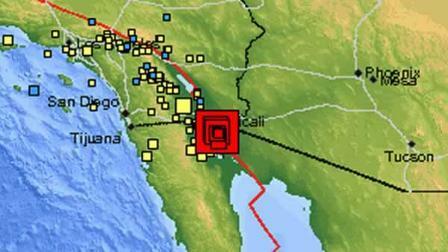 There were 46 quakes greater than 2.5 between December 30, 2009 and January 1, 2010 in the Baja east of San Diego. A 5.8 quake occurred east of San Diego on December 31, 2009. The area of the quakes is on the San Andreas, and therefore right on a fault line, but nonetheless this raises the possibility of the rip up toward Mammoth Lake, California being in the near future. ZetaTalk Comment 9/9/2006: We have chimed in with Scallion on suspecting that a rip will occur from San Diego up toward Yellowstone, as there is a fault line there. Why would this rip, in a manner that would disrupt Mammoth? As we have stated in detailing the Earth Torque, wherein New England is pulled toward the East and Mexico toward the West, pulling the N American continent in a diagonal, fault lines will not be stressed in their traditional ways, but in new ways, during the coming months. New Madrid is an example. East of the Mississippi, going up, West of the Mississippi, going down. In a similar manner, the fault line from San Diego to Mammoth, and on up toward Yellowstone, will find the land South going West, with Mexido, and North staying with the land above this fault. Thus, should such rupture take place, in stages, evacuate Mammoth Lake! The original ZetaTalk prediction on this rupture places it in the timeline "some months" before the pole shift, a clue of sorts to a timeline when this rupture occurs. ZetaTalk Prediction 2/15/2000: Of course all volcanoes will explode, as this is going to be a very severe pole shift. What about the months and years preceding the pole shift? It is no secret that Mammoth Lake and the caldera of Yellowstone are warming up, and the populace has been prepared for these occurrences by the movie Volcano where there, in the middle of LA, lava is bubbling up. In fact, there is a fault line running from the approximate San Diego/LA area, up into the Sierras, and this is liable to rupture rather violently during one of the quakes that precedes the pole shift by some months. Volcanic eruptions from that area in the Sierras can be expected. Looking closely at a map of the area, it can be seen that there is a rift running from San Diego directly north to the Mammoth Lake area. This confirms what the Zetas have said about a hidden fault line. ZetaTalk Explanation 10/6/2007: We have repeatedly warned that the US southwest was going to undergo a bowing stress, a situation that would last until the N American continent adjusted by a diagonal rip along the extended New Madrid Fault line, which includes fracturing from New England through the Midwest and down into Mexico. Until that adjustment occurs, Mexico is tugged to the west, causing a bow to form along the West Coast. 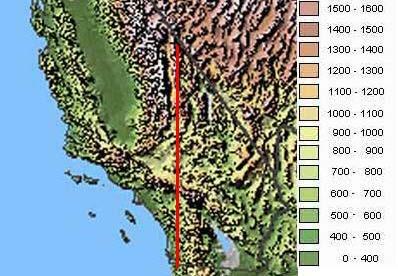 The bow causes compression at its center, at the San Andreas Fault line near San Diego, and expansion inland. This bow is what caused the Utah mine collapse, as we explained at the time. Indirectly, this bow is what caused the Minneapolis bridge collapse, as it forces the St. Lawrence Seaway to open, causing adjustments all the way to the Black Hills of S. Dakota. San Diego is lowlands, as the nearby presence of the Salton Sea shows. This area will compress more than land to the north, as the rock is now less thick as it has proved to be pliable in the past, and distended. San Diego is thus due for a grinding action, a tumbling action, as the bow comes under increasing stress. When the New Madrid Fault line adjusts, the stress on this bow will relax but another nightmare will emerge - new adjustments along the San Andreas Fault line. Now the western half of the N American continent is free to jut to the west, at a diagonal, so slip-slide all along the San Andreas Fault line will occur for some time. We have mentioned that a rip will occur from San Diego up through Mammoth Lake of California and on up toward Yellowstone at some point. As one can see from a topographical map, there is a rift along this path, where ripping has occurred before. This too is awaiting the San Diego area, which will by that time be an almost unlivable area.